Expert practitioners of conjunto, the raucous, accordion-driven music that came into being in the Texas of the 1800s, Los Texas Wranglers provided a driving backbeat to the Joe’s Bakery 50th Anniversary party held at Fiesta Gardens in East Austin last week. Pictured: Julian Fernandez, the backbone of the band. 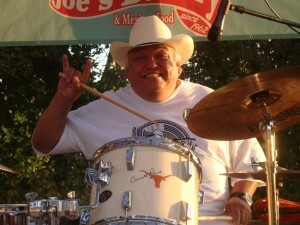 Los Texas Wranglers regularly win awards as being the finest purveyors of conjunto in the Great State. Mr. Fernandez took a moment from beating the traps to mug it up for this photographer. This entry was posted in Texas Daily Photo and tagged Austin, conjunto, east austin, joe's bakery, los texas wranglers, texas. Bookmark the permalink.